bronyhub has not added any external profiles yet. Well I guess it's a good thing I already had a Disqus profile then. Don't post much anymore here on EQD but I do lurk from time to time. Still enjoy ponying out with you guys. Attenborough: "Here we see the majestic miniature pony, Equus Minicsucles navigating an environment much like the one found on its home-world. This quadruped unlike its earth-based cousin, is both intelligent and highly adaptable. When we return we will see how such an interesting specimen evolved, and how they found a way to our world in this four-part series, The Secret Life of Ponies." I still want to enjoy everything else this site has to offer. I just wish we could filter content. Much like I'm sure there will be some that don't want to view Them's Fightin Herds content. Sure just tell people to leave. Or you know, expect people to have differing opinions on things and express said opinions. No unicorns, no Pegasus, no dragons, or any of the dozens of cool mythological creatures we've seen (with the exception of the dazzlers for like a few seconds of screen-time they were sirens). No going on epic adventures. No interesting new lands with unique civilizations (like the Crystal Empire). 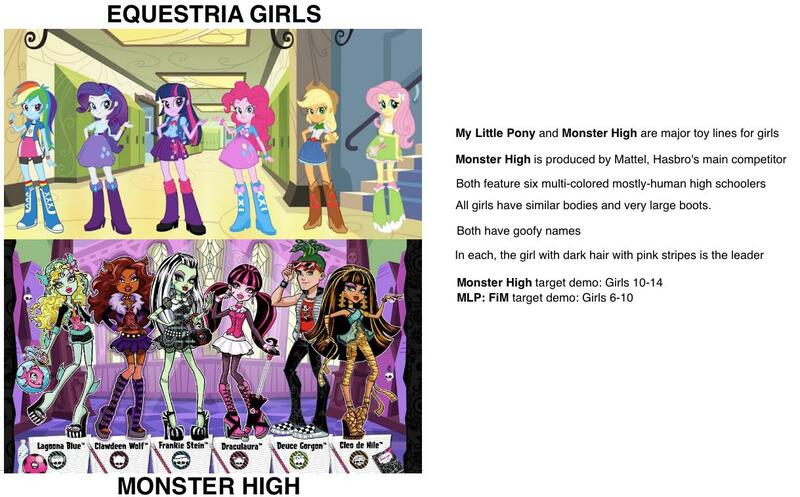 All is replaced with characters whose odd designs and strange skin tones were made solely to compete with Monster High. And the whole thing is set in high-school instead of the awesome universe of our little ponies. Yep other than that, just like FiM. Better these posts than the posts related to Equestria Girls. Them's Fightin Herds at least feels like it's set in the FiM universe given the obvious source of the artwork and the game's doomed predecessor. Doesn't hurt that the game looks like it's going to be a blast with an awesome soundtrack to boot! The art in this actually looks really good! I was worried it would be generic production art and stock vectors. This is actually beautifully done. Going on my "to buy" list for sure! New President in 2016? *pft* Big deal! Bring on the pony! Been there twice now; had a blast both times! Really hope sophiecabra has a booth for 2016. She has some awesome art and it was a shame she couldn't make it for 2015. Wow to think some thought the show wouldn't even last to a second season. It's amazing to see how far some interesting characters and good writing can carry a show even through all the changes and spinoffs over the years.